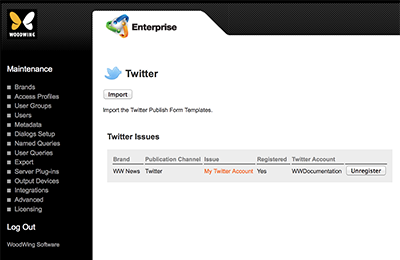 Importing the Publish Form template provided by the Enterprise Server Twitter plug-in. Registering or unregistering an Issue with a Twitter app . Defining specific settings for using the Twitter integration. All tasks are performed when configuring Enterprise Server for publishing to Twitter. The Twitter Maintenance page appears. Troubleshooting: why does Twitter not appear on the Integrations page? The Twitter icon is only available on the Integrations page when the Server plug-in "Twitter - Publishing Connector" is enabled.